TAXI driver and Catholic father-of-four Aguek Nyok is still coming to grips with being publicly hailed a hero for helping save 11 people caught in a bus fire in Brisbane’s south on October 28. Mr Nyok, who fled from the horrors of war-torn Sudan more than a decade ago as a refugee, was the only person to run towards the burning bus, kicking in the back door after the driver Manmeet Alisher was allegedly set alight in the driver’s seat. A 48-year-old man Anthony Mark Edward O’Donohue has since appeared in court charged with murder, arson and attempted murder. The fire cut off access to the front door of the bus, forcing passengers to retreat to the back. On October 28, Mr Nyok was passing through Moorooka. 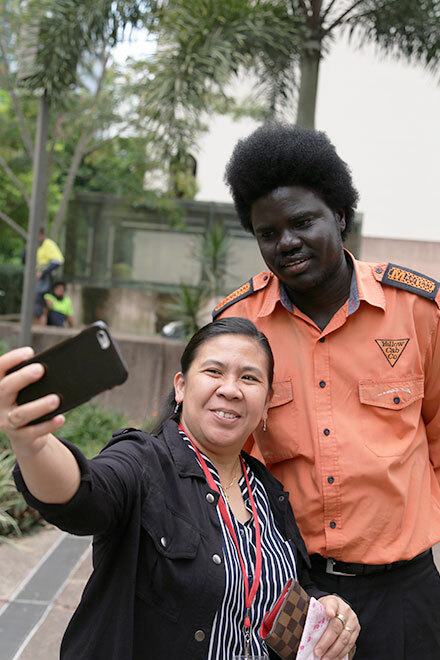 Recognised: A passerby asked to take a selfie of Aguek Nyok after being hailed a hero in Brisbane. Photo: Mark Bowling. He told The Catholic Leader he had stopped for a haircut, and ran to help after seeing the fire. He ended up using his karate skills to kick in the door of the burning bus. “I realised people, they were screaming at the back door … They were saying ‘please, open the door; please, open the door’,” Mr Nyok said. For a few seconds, 31-year-old Mr Nyok stood, hoping the driver would open the door for them, but that didn’t happen. “So that’s the time I decided to do something about it, so I decided just to break the back door for them to get out,” he said. Mr Nyok said the door was jammed. It took three kicks to force the door open and there was too much smoke to even attempt to rescue the driver. 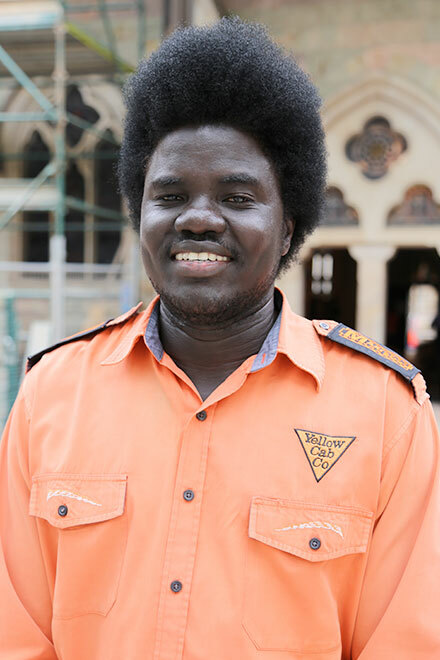 Chaplain for Brisbane’s Sudanese Catholic community Fr Stephen Kumyangi has praised Mr Nyok’s action. “What he did for rescuing the people is a very heroic act,” he said. Mr Nyok said he just did what he would expect his fellow Australians to do in the same situation. “It could have been me on that bus,” he said. Horrified eyewitnesses, his employer, as well as senior police, including Commissioner Ian Stewart have also labelled Mr Nyok a hero. “We’re pretty proud of him,” Yellow Cabs fleet operations manager Marty Ord said. 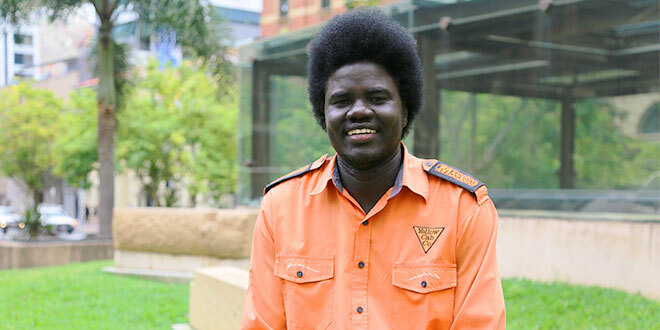 Mr Nyok fled from war-ravaged South Sudan, and arrived in Australia in 2005 after years spent in refugee camps. His four young children were all born in Australia. His family attends a Sudanese Mass at Mary Immaculate Church, conducted in English and Arabic, although he said, he often found it difficult to attend because of his taxi shifts. He has returned to work, not believing he did anything special, but admitting he needed time to recover from the horror he saw. “I’m getting there – not trying to think about it, just get my head around it,” he said. Queensland Premier Annastacia Palaszczuk will recommend Mr Nyok for a bravery medal. “He saved 11 lives that day … he put his own life at risk,” she said. “What a hero.